Editor’s note: This is part four in a five-part series about the environmental histories Jess Dunkin encountered while travelling from Ottawa to Yellowknife this past spring. Read the full #NextStopYZF here. Thirteen days after the spring equinox, I awoke in Regina to snow on the ground and a cold, cutting wind. This was particularly egregious given that I had spent the previous day in shorts and a tee shirt. 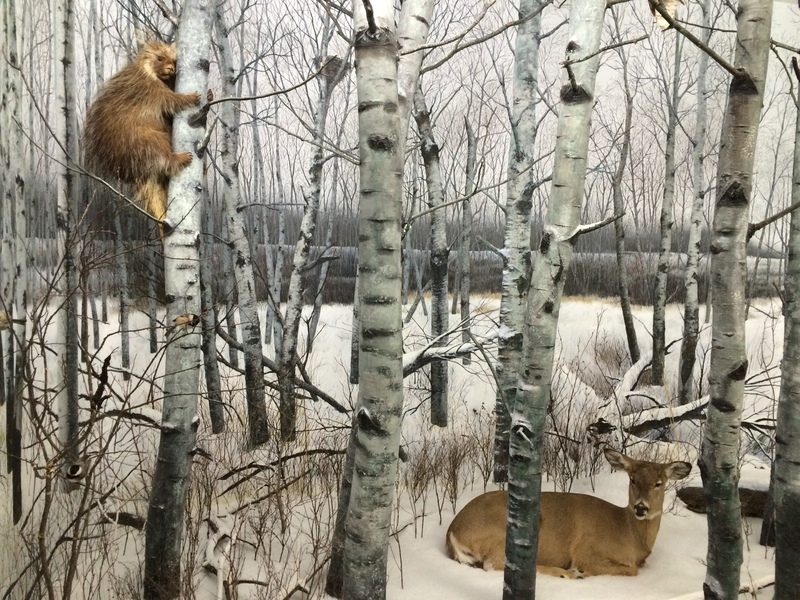 The Royal Saskatchewan Museum (RSM) seemed a perfect place to escape the return of winter. Royal Saskatchewan Museum, Regina, SK. I had multiple, competing reactions to the dioramas in the Life Sciences Gallery. First, I was impressed by their detail and artfulness. Were I to visit the museum on a regular basis, I would continually find things I had not noticed before: a blossom here, a bug there. On this front, I couldn’t help but think of Will Knight’s work on natural history museums as I made my way through the exhibit. I was a doctoral student with Will at Carleton. During seminars and more informal discussions, he would often speak about the intricate and often invisible labour that was undertaken in relation to natural history museums: the collection of objects, the preparation of specimens, the construction of diorama scenes. At the Royal Saskatchewan Museum, I encountered this unacknowledged labour up close. Second, I learned much about the province’s flora and fauna through these representations, as well as the accompanying interpretation. The specimens and scenes were interpreted through long thin panels that ran the length of the diorama, as well as larger rectangular boards that were positioned to the sides of the display. The former tended to have information about specific species depicted in the diorama, while the side boards offered context to the scene being presented or picked up on specific themes represented in the display. 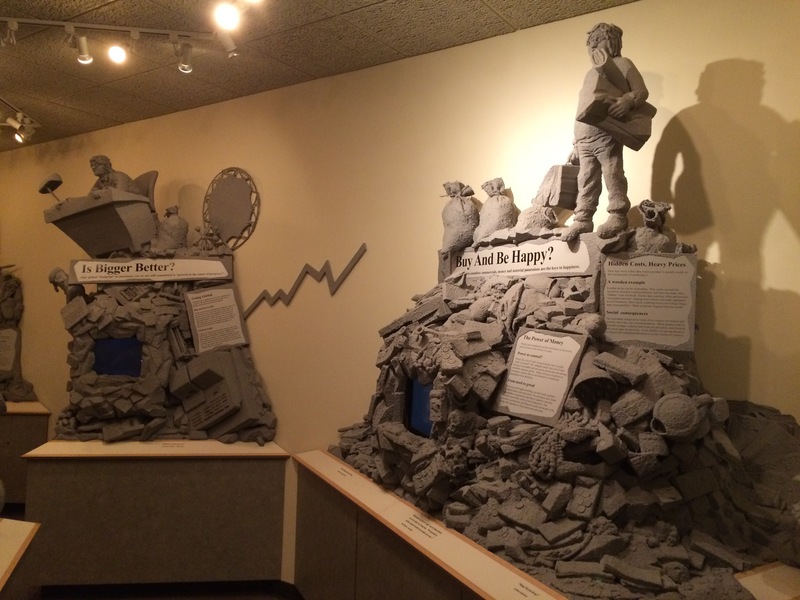 There was some attempt to counter this with an exhibit at the end of the Life Sciences Gallery titled “The Human Factor.” This display explores the various stresses facing global ecosystems from pollution and poverty to resource depletion and the uneven distribution of wealth and power. While the messaging in this gallery is provocative, in a very tangible way it reproduces the fallacy that humans are outside of nature by locating them in a separate section of the gallery. It also physically separates the ecosystem from the threats. Finally, in taking an almost exclusively global approach, the Human Factor gallery avoids addressing local realities. I couldn’t help but think of the (unnamed) ways in which agriculture, mining, and urbanization, both historically and in the present have shaped Saskatchewan’s natures. 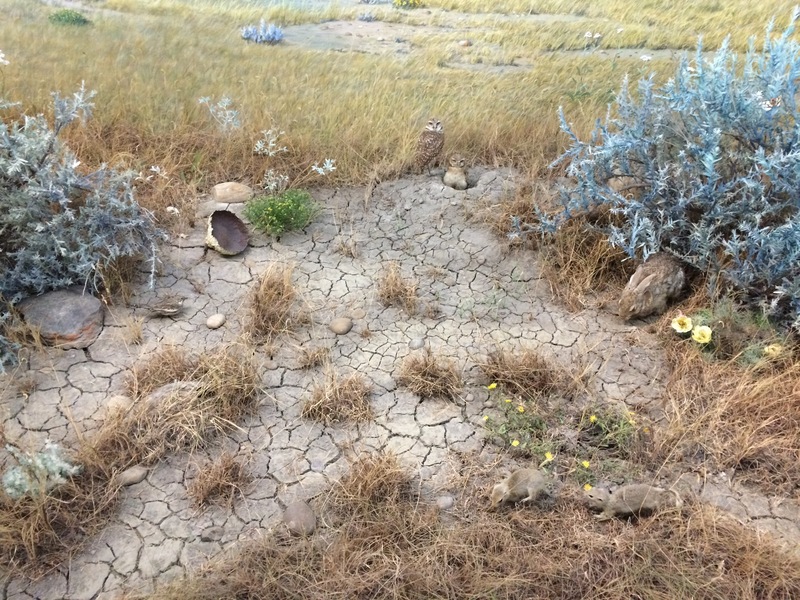 One (relatively easy) way to address this disconnect between the dioramas and real ecosystems is to offer place-specific interpretations – that is, to use the dioramas themselves to address local threats to ecosystems. For example, the caribou diorama could have panels discussing how habitat loss in northern Saskatchewan as a result of deforestation, roads, and mining is contributing to declining herd numbers. Similarly, the destruction of the bison could be treated as more than a curious historical fact afforded only a single sentence in the exhibit. A more appropriate interpretation would address how colonialism and capitalism have reshaped the province’s ecosystems, as well as the lives and livelihoods of Indigenous inhabitants. On April 3, I returned to the open road and prairie landscapes. A drive across the prairies isn’t complete without a stop or two or ten to snap pictures of the region’s iconic grain elevators. Most of these photos capture elevators built in the late nineteenth and early twentieth centuries. For me, there was a certain appeal to more recent incarnations of elevators, the large multi-silo regional storage facilities. A brief look at the changing architecture of grain elevators sheds light on shifts in technology, the economy, and social life on the Canadian prairies. Elevators emerged in response to the dilemma of transporting prairie grains to other markets. Named for the conveyor belt (or ‘leg’) that used cups or buckets to raise the grain from the ground-floor intake to the top of the building, these large vertical warehouses provided an efficient means of processing, storing, and shipping grain. The first grain elevator was raised in Niverville, Manitoba, in 1879. Within a few years a style of elevator more familiar to contemporary eyes with a gable roof and/or a gable-roof cupola began appearing across the prairies. Most housed upwards of 25,000 bushels of grain. These early elevators were erected at regular intervals along the railway (typically every 10-20 kilometres) to accommodate farmers travelling by horse and buggy. Villages and towns grew up around these sites to further accommodate the needs of farmers. Waivers from the sale of grain at the elevators were used to shop in neighbouring stores or buy a drink at the local hotel. The location of elevators at the physical heart of villages and towns speaks to their economic and social importance in rural life. Elevators provided more than a place to sell and store grain, they were also social and political spaces. For example, they provided the impetus for farmer-owned cooperatives like the Saskatchewan Wheat Pool, incorporated in 1923. While the shape of elevators remained the same well into the twentieth century, they increased in size. By the 1920s, elevators could hold 30,000-40,000 bushels of grain. The 1920s also saw the addition of annexes, which provided additional storage. Some annexes were simple boxes, others took the shape of a smaller elevator. In the 1970s, large metal bins holding upwards of 30,000 bushels became common place annexes. Factoid: Until the 1960s, almost all elevators were painted CPR red. Beginning in 1962, corporations began using other colours in order to distinguish themselves from the competition. Over the course of the twentieth century, changes in technology enabled farmers to cultivate larger plots of land and produce greater quantities of grain. Branch lines and the wooden elevators that sat beside them were closed in favour of larger more centralized facilities. In the 1970s and 1980s, different companies experimented with pre-cast concrete and steel elevators before settling on concrete silos similar to the terminal grain elevators common in port towns from the 1910s. These elevators could hold up to 50,000 tonnes of grain (1 tonne is roughly equivalent to 36 bushels) and load a train of 52 cars in less than a day. While elevators continue to be built today (a new facility in Colonsay, SK, which will hold 42,000 tonnes of grain and load up to 134 cars in 12 hours, is one of four elevators being built by Canadian Wheat Board), the heyday of the grain elevator on the Canadian prairies came in the 1930s, when there were more than 5,700 elevators. As of February of this year, there are 401 functioning elevators across the country. You can access a full list of them here. Grain elevators are an important part of the visual landscape of the prairies. They are also testaments to a particular socioeconomic system. This makes them ideal subjects for heritage conservation. Efforts to preserve the elevators, however, are scuttled by the elevators themselves. Like the tower in Pisa, they lean, making them difficult to stabilize. They are prone to fire, hard to clean, and difficult to convert to other uses. There are also financial and legal impediments to preservation. Most companies choose to tear them down to avoid paying further taxes and towns are loathe to take them on for reasons of liability. 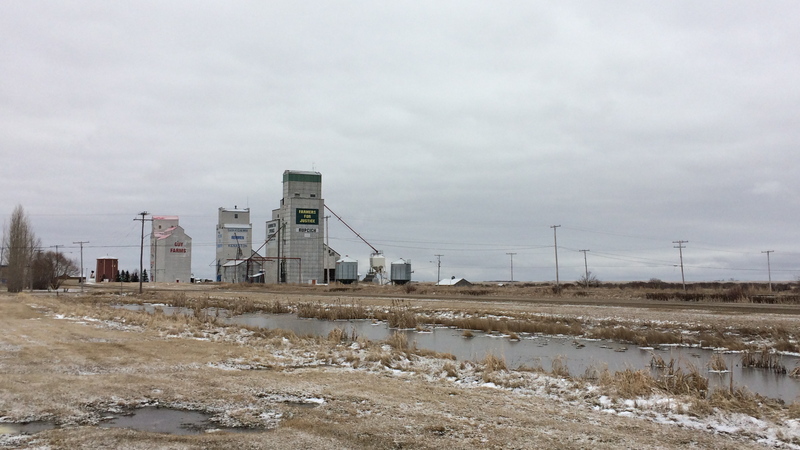 Still a handful of elevators have been saved as historic monuments, most notably in Inglis, Manitoba. 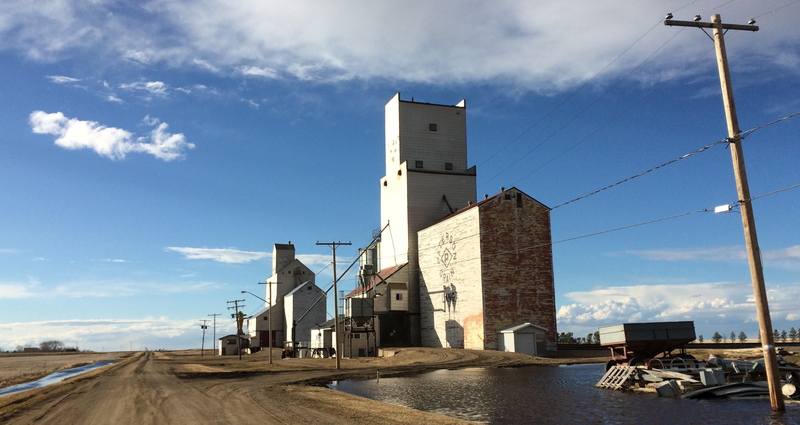 My understanding of grain elevators owes much to this article by Patricia Vervoort. For those interested in reading more about grain elevators, this bibliography should keep you busy. If it’s photos you’re craving, try this site. In the final Next Stop YZF post, my westward journey becomes a northern one, although as we shall see, there is still a bit of prairie to be seen. Jess Dunkin is the Director, On the Land Programs at the NWT Recreation and Parks Association. She lives in Chief Drygeese Territory (Treaty 8), home of the Wıìlıìdeh Yellowknives Dene. In her free time, Jess loves to paddle, cross-country ski, and tweet about life in the #SpectacularNWT from @jessddunkin.